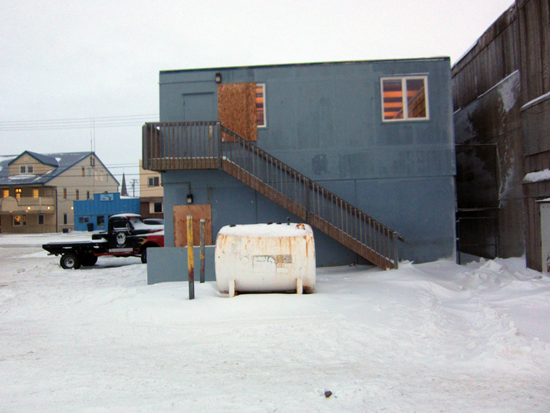 Photo courtesy of KNOM Radio Mission: Home and business owners begin to board up their windows in preparation for the Western Alaska storm. Alaska’s Division of Homeland Security has been helping western villages prepare for the storm for the last 24 hours. Bryan Fisher is Incident Commander for the Division. He says most of the communities have been trained in the last few years to respond and prepare for this type of disaster event. Fisher says the Division also trains frequently to respond to fall storms. He says Homeland Security did not field any requests to help communities evacuate people ahead of the storm. He says a few villages have set up local shelters that some residents are already taking advantage of. The Division will be ready to respond to calls for on the ground support as soon as the storm lets up and will also help with damage assessments. Fisher says the timing of the storm increases the potential for damage.